Skip the manicure and go natural for healthy, flake-free fingernails. Check your toenails. If they are strong and do not flake, the problem with your fingernails is external. If you have the same problem with your toenails, make an appointment with your general physician or dermatologist. Flaking nails may indicate an iron or other vitamin deficiency. Begin taking a multi-vitamin containing biotin, which helps strength nails and speed their growth. You can find a hair, skin and nails vitamin at most drug stores. If you have any questions regarding a particular brand, ask your physician or pharmacist. Stop polishing your fingernails. Some people’s nails do not react well to nail polish remover, even the acetone-free variety, which can cause the upper layers of your fingernail to dry, separate and peel. It will take at least six months for the damaged nails to grow out. Buff your nails once a week. Buffing removes a small layer of your nail keratin. Over several weeks, you will remove the damaged layer and reduce the appearance of flakes. Continue the habit even after flakes have disappeared to maintain a healthy shine. Leave the flakes alone. It is tempting to peel back the exposed flakes at the tips of your nails. However, you will only weaken your nail, increasing the chances you will break or tear it beyond the nail bed. If the bubbled appearance of flakes bothers you, keep your nails trimmed short while the damaged nail grows out. Moisturize your cuticles with a cuticle oil or cream. 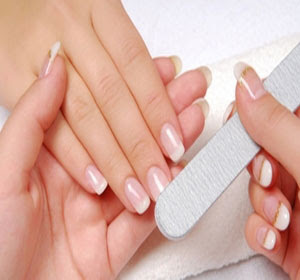 Moisturized nails are stronger and less prone to flaking and breakage.